SPRUKE — BRISBANE’S UKULELE FESTIVAL is on 13-15 September 2019. We have a new venue at SunPAC and the adjoining Sunnybank Sports and Community Club, which gives us some exciting new options for performing stages and workshop venues. The festival theme is Uke’n Make Music! We’re looking for a variety workshops that involve people in all aspects of making music or ukulele related e.g. ukulele skills, singing, performing, accompanying instruments (harmonica, cajon etc), recording, or even caring for your instrument. Please note, we have found detailing the workshop content and outcomes, will increase the likelihood that participants will pre-book tickets. Workshops should be 45-60 minutes long. Applications close midnight Sunday 26 May 2019. Please use these image specs to help us to create images that fit our templates. List your areas of expertise, and tell us about your experience in presenting workshops, and describe your approach to teaching ukulele. Describe your workshop in detail. Include the maximum number of participants, level of experience required, and the workshop content. Will you need a laptop, data projector & screen, DIs, mics, or a music stand? This year, application forms for performances and workshops are separate. Apply to perform at SPRUKE through our Application to Perform web page. If you are experiencing difficulties with this form please try using Chrome for your browser. If you are still having problems please send all your application details and image (as detailed below in form) to perform@spruke.net.au. SPRUKE 2019 — BRISBANE'S UKULELE FESTIVAL (13-15 September). To minimise frustration when completing this form, please complete EVERY field before hitting Send. Put N/A for any fields that are not applicable to your application. To assist us in creating image files that fit our website and Trybooking templates, please send images files that meet these image specifications. Describe your areas of expertise, experience in presenting workshops, and approach to teaching ukulele. Describe your workshop in detail. Include the duration, maximum number of participants, level of experience required of participants, and workshop content. I can provide handouts for up to 40 people for this workshop. I will email workshop notes to participants after the workshop. SPRUKE 2019 workshops will be run on during Saturday 14 September and Sunday 15 September. Please bear in mind that we have a limited budget, and SPRUKE workshops are made as affordable as possible for festival-goers. Thank you for understanding. Please tell us what you think you will need, e.g. projector and screen, laptop, DIs, mics, music stand. 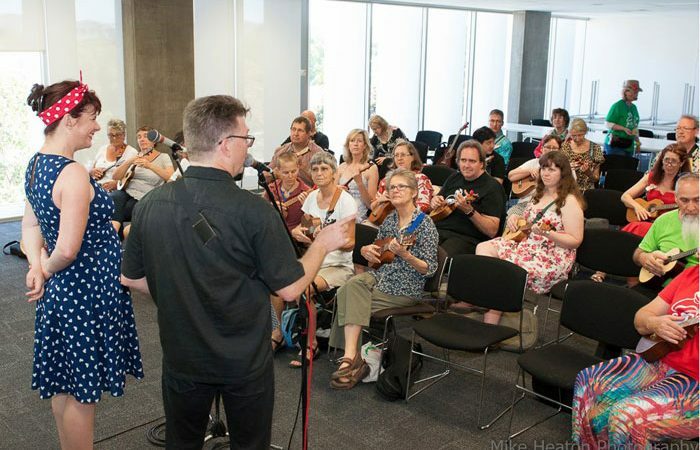 SPRUKE 2019 — Brisbane’s Ukulele Festival and Brisbane Ukulele Musicians Society Inc reserve all rights in relation to the selection of performers and workshop presenters for the festival.